With beautiful décor, upgraded tile, and laminate flooring you will love this 4th floor, 2 bedroom, 2 bath Villamare corner villa. Enjoy some downtime listening to the ocean from one of your two private balconies. The bedrooms provide privacy while open floor plan of provides plenty of space for socializing. The kitchen offers upgraded cabinets and seating for 2 at the breakfast bar. The living room, in cool hues of taupe and light blue, features a flat-screen TV, a spacious sectional, and beautiful landscape views of the lush grounds. The king master suite offers a private bathroom, with upgraded cabinetry, a walk-in shower, and garden tub. The 2nd bedroom is outfitted with 2 queen beds and a private bathroom. 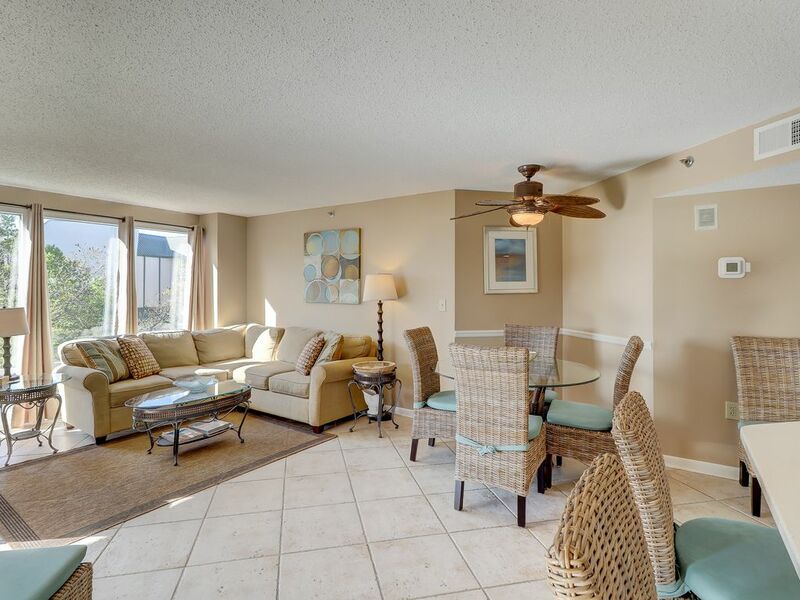 Villamare is located on one of the most beautiful stretches of the Atlantic Ocean and it's convenient to all the amenities Hilton Head offers. In addition to its fabulous location, Villamare also offers an on-site fitness center, an indoor heated pool, as well as a gorgeous oceanfront pool. You can't go wrong with Villamare! Best relaxing vacation again for the second year!! We stayed at the same exact condo as last year. The resort and the pool area make you feel like you are on a Caribbean island! We rented beach umbrellas and bikes for the week. The bike trails are beautiful and I rode the bike to get groceries a few times it is very relaxing. The skull Creek grille is a must! Go right before sunset, it is perfect pictures. So much to do if you want in area. I enjoyed grilling steaks and corn and potatoes. The dune buggy transportation is great if you don't want to drive. We had a great vacation at HH. we loved our stay at Villamare, it was all we expected and more. Definitely come back again! We had 1 of the best and most relaxing vacation in years at Villamare. I would recommend condo to a family. It was me and my wife and 2 daughters. My daughters room has 2 queen size beds and a nice round glass top table etc.. The condo is very large with private balconies etc.. We rented bikes as a lot of others do since there are a lot of bike trails. Great place...very well equipped. Much nicer and more updated than other places at same location. Quick easy walk to beach...even with 6 kids and all their stuff! Just like home but with a beach! We had a wonderful week in your condo. We felt right at home, the decor, furnishing and beds (very comfy) are perfect. Loved sitting on the patio in the evenings, walks on the beach (super clean) and of course the golf. The Villamare is a very nice and well kept property and just minutes away from some of the best restaurants on the island. The keyless entry was a nice surprise and we appreciated the wireless internet, both very easy to access. Your condo was definitely one of the highlights of our vacation. Thanks for sharing your piece of paradise with our family!! !